Road sweepers are often required when dealing with large construction or engineering projects. They are also necessary to maintain the safety and cleanliness of public spaces. What are some of the features that you should address when considering a road sweeper hire service? Let us examine four categories to clarify in advance. If you are curious to know which specific models are available, it is best to contact the supplier in question. Contract lengths will naturally differ depending upon your work requirements. This is why it is a good idea to estimate the amount of time that the road sweeper will be needed for. Another interesting point to mention involves the use of qualified personnel. In the event that no one in your firm is trained to use such a unit, are there any alternatives? You will be pleased to learn that the top rental companies will offer all-inclusive contracts which supply a trained operator. This is the best way to ensure safety at all times and to fulfil any regulatory requirements. 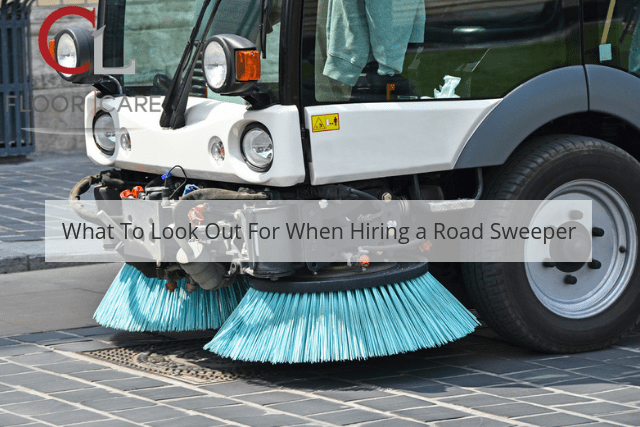 The majority of road sweepers are equipped with two cylindrical front brushes. These spinning units are intended to sweep up any debris and guide it towards the back. Another rear-mounted brush will then place this loose material into a storage hopper for disposal at a later time. However, there are also vacuum and suction cleaners. The need for these will revolve around the type of surface being addressed, so be sure to consult with the provider for more details. If you happen to be working within a dusty environment or should you be concerned about public air quality, it is best to rent a unit equipped with water jets mounted underneath its chassis. These will dramatically reduce the amount of material thrown into the air during a cleaning project. These are some of the major variables to examine when choosing a professional sweeper hire service. If you would like to learn more or to obtain a transparent quotation, please contact CL Floor Care when convenient.